Evaluation of institutions, entities and social groups (source: Metroscopia for El País, 25/08/2013). The Spanish newspaper El País published yesterday a survey it had commanded to Metroscopia about the confidence that Spanish people had in different institutions (see the complete article, in Spanish, “Por qué no se hunde España“). See a summary of the results in the graphic to the right. Following an exercise during a training module last year, I published a post discussing a similar survey which is yearly made in Britain by the consultancy Ipsos Mori, the Veracity Index (see in the link results from 1983 to 2011). 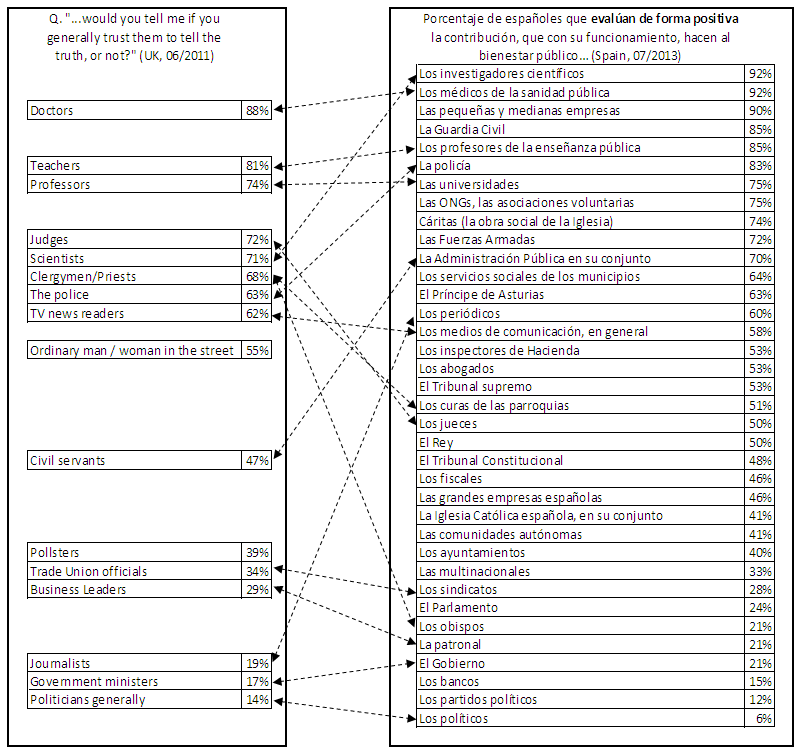 I thought that it could be interesting to show the results of both surveys side by side to try to spot some commonalities and some differences of how the different groups and institutions are perceived in Britain and in Spain. I did the comparison even if the questions used for the survey are not exactly the same in both cases and if one survey dates from 2011 and the other from 2013. See the comparison in the picture below. Another difference is that the Spanish survey is including up to 36 different groups versus 16 being evaluated in the UK, but this is not impacting the comparison as each group is rated individually. 4 institutions / groups are very well-regarded in both countries, with a rating over 70% in both cases: doctors, teachers, professors and scientists. 4 institutions / groups are very badly regarded in both countries, with a rating of around 30% or lower in both cases: unions, business leaders, government and politicians. 3 groups are much better perceived in Spain than in the UK: the police, civil servants and journalists. 2 groups are much worse perceived in Spain than in the UK: judges and clergyman/priests (especially bishops). Comparison of confidence polls in Britain (2011) and in Spain (2013) (sources: Ipsos and Metroscopia for El País).